Turkish and U.S. troops carried out the second round of trainings for combined patrols in Manbij, northeast of the Aleppo Governorate in Syria, as part of a deal to rid the area of the YPG/PKK terrorist group, the military said Sunday. 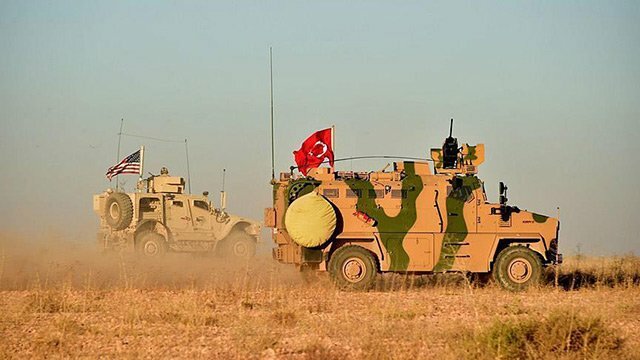 The Turkish Armed Forces said on Twitter: "In accordance with the Manbij Road Map and Security Principles, Turkish and the U.S. Armed Forces troops completed the second joint trainings on combined patrol activities in Manbij." Turkey’s National Defense Minister Hulusi Akar had announced earlier in October that Turkish and U.S. soldiers started joint training on combined patrols in the city. Turkish and U.S. troops began joint patrols in Manbij on Nov. 1 as part of an agreement that focuses on the withdrawal of YPG/PKK terrorists from the city to stabilize the region.